Pool skimming just became a breeze with Skim-eeze! Skim-eeze is an innovative new device that allows you to effortlessly skim your pool. Stationary pool skimming device that uses the pool's circular flow of water to automatically gather free-flowing debris in pool. Symmetrical shape with handles on both sides enables it to be used in any pool, regardless of direction of the pool's water circulation (flow of water). Finger grips on the clamp make it simple to use and insert into skimmer port. Collects leaves, grass, acorns, small sticks, insects and pollen. Ideal for most above ground or inground pools. 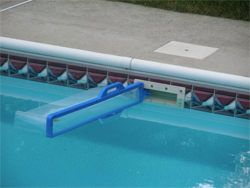 No need to worry about corrosion because the skimmer is made of pool safe materials. Spring loaded to fit mouth opening of skimmer between 5¾" and 6½"